This Saturday marks the official start of fall, and there are tons of fun events in Hendricks County to help you kick off the season. The following are just a few ideas of things to do this weekend, but remember you can always check our Events Calendar for even more ideas any time. The Quaker Day Festival in Plainfield is one of Hendricks County&apos;s can&apos;t-miss events. The festival begins at 8 a.m. Saturday on the lawn of the Plainfield Friends church. Craft and community vendors will be set up on the lawn throughout the day. A community parade will take place at 10 a.m. A lunch will be available for purchase at the church 10:30 a.m.-3 p.m., and there will be a car show under the trees from noon-4 p.m. If you&apos;ve never been to Montrose Farms in Brownsburg, this weekend is the perfect opportunity. Montrose Farms will host its annual open house from 11 a.m.-3 p.m. Saturday. 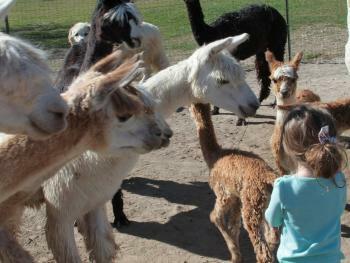 The event will include tours, vendors, a photo booth, and an opportunity to win alpaca products. Admission is just $3. Do you love live music? The 4th Annual Danville Jam will feature four live bands at the amphitheater at Ellis Park from 3-10 p.m. Saturday. Bands include Sky&apos;s the Limit, 4Score, James & Hobbs, and 3rd Street Band. Admission is free, but donations will be accepted to cover the cost of the event. Be sure to bring a cooler and lawn chairs. Show off your Ping Pong skills at the Avon Ping Pong Tournament from 2:45-5 p.m. Saturday at the outdoor tables at Avon Town Hall Park. This event, hosted by the Avon Parks and Recreation Department, is free and open to participants ages 12 and up. While you&apos;re at the park, make a day of it by enjoying its other amenities including a disc golf course, playground and plenty of scenic areas for a picnic. I hope you enjoy the first weekend of fall!